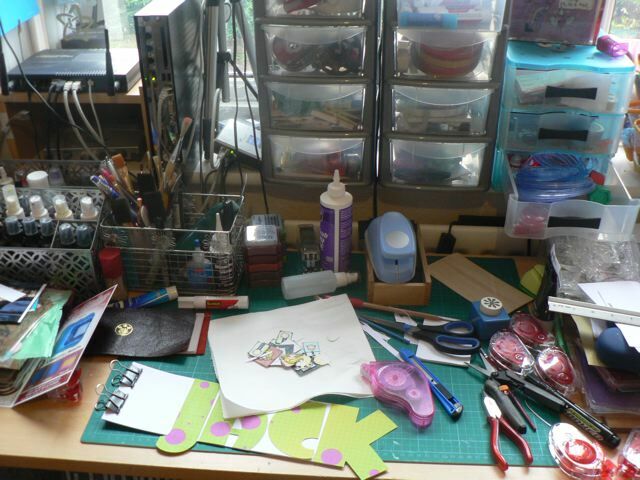 Just a reminder to you to check out WOYWW – I always look forward to seeing desks at least as messy as mine! What’s interesting today? The cardstock Word book from yesterday (see the PDF in the sidebar) and a little pile of heads-only Stampotique people for something I am working on (hopefully ready to share that soon). The morass of cables that hook up the router, the VOIP phone, and the security camera – how I hate them! – and lots and lots of clutter. Hopefully your desk isn’t the disaster mine always is but if it IS, then at least it’s because you are in the midst of a creative frenzy! There has been some discussion on making custom word books over on UKS, so I thought I would share how I do mine. This one uses a font, filled with digital patterned paper, then hand cut, a very FAT font, and a short word. I did a quickie PDF for it, which I hope addresses how you can do the same with your Cricut or Robo or Silhouette or whatever. And the PDF is in the sidebar, or by clicking here. Sorry I missed out yesterday but we are doing a Fall Clean, getting the garden and house ready for the winter months ahead. I re-organized my book shelves yesterday and packed up about 4 carrier bags of books I know I will not re-read so safe to pass on. It should be the kitchen cabinets today but DD has her Botox (shame on you! Not for her looks, for her cerebral palsy) today and I will probably not get to it, depending on how she goes. I think this blog is just brilliant. There is so much inspiration here! I love the recent post she wrote and links here about buying cheap notecards from the $/£ store and adding your own personalization with your printer. Brilliant. The free digital downloads here are fab, and so many of them! Lots of adorable images to add to cheap canisters to make them look much more expensive, and good instruction so you can do it yourself. Honestly, you skip checking this blog out at your peril. It will keep you busy all day, jump-start your creativity like you would not believe, and provide you with images and downloads that will keep you happily crafting for days to come. I cannot urge you strongly enough to check it out. Really. I’m gushing, I know, but once you visit you will TOTALLY get why. SDC 15 – Happy Birthday! September is loaded with birthdays for us – Dad, Sis and MIL all on 14 September, and a niece earlier. While the cards may not make it by the actual day, I have tried to make them all one this year. Usually it’s E-cards cause I am HOPELESS getting to the next village over to the PO. Maybe I’ll just email the images of the actual cards – as a sort of hybrid-E card! I missed out the last Stampotique Designers Challenge being on holiday, so glad the subject of this one was right in line with what I needed to do! If you saw the little 2 minute video about cutting custom shaped cards (or mini-book pages) using Nestabilities, you will recognize that technique here. 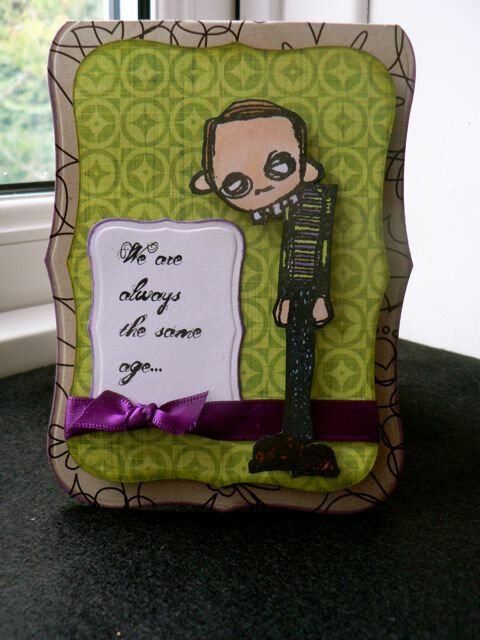 Doing the little tiny mini-albums based on the same concept but with punches gave me the idea. 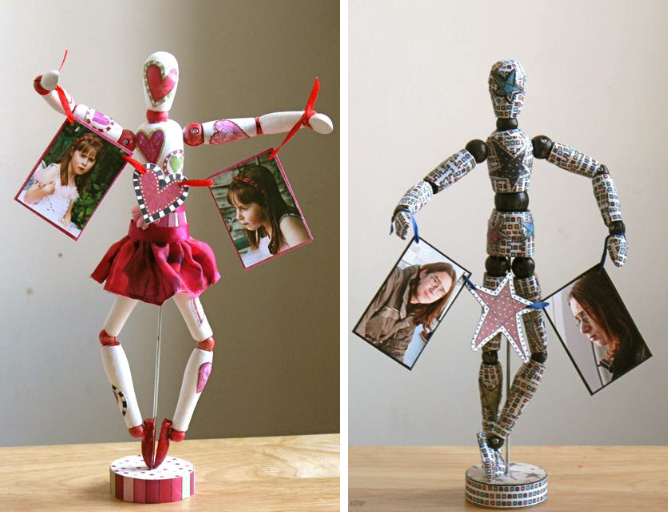 As I already have a Craft Robo and a Cricut I never really saw the sense of Nestabilities. But I got a couple of sets, have been having a good old play with them, and the result was this card (as well as the other one in the post about making stamps from your embossing folders.) I really love the shape of the rectangle ones. The font is Mosh 1 (cause I did have at least one question about that the last time I used it (Hi Patty!)) which, as she commented, goes very nicely with the Stampotique images. The quote is from Gertrude Stein, a favourite. Since it’s for my Dad, I didn’t add things I might usually have done, like swirls in the empty spots, as he def. is NOT a swirly kinda guy. It’s a bit more restrained, although what he will make of the lime-green-and-purple, I’m not sure. The rest of my day will likely be spent sorting projects for the crop tomorrow, and cleaning and grocery shopping, How tedious. But nice to be creating again. I do wonder if there will still be a challenge as Stampotique is closed for October – I do hope the stamps I ordered name it to my MIL to carry over to me as an early Christmas present! There are some fab ones on the site. I love every one I have and crave more, more MORE! Do pop over to Julia’s for a linky list to lots of other interesting desks! I am always inspired by what I see there! Bet you will be too. Categories: cards, stamping, WOYWW | Tags: stamps | Permalink. You know how, sometimes, you have some scrapbooking supply that you wish you had in another format? 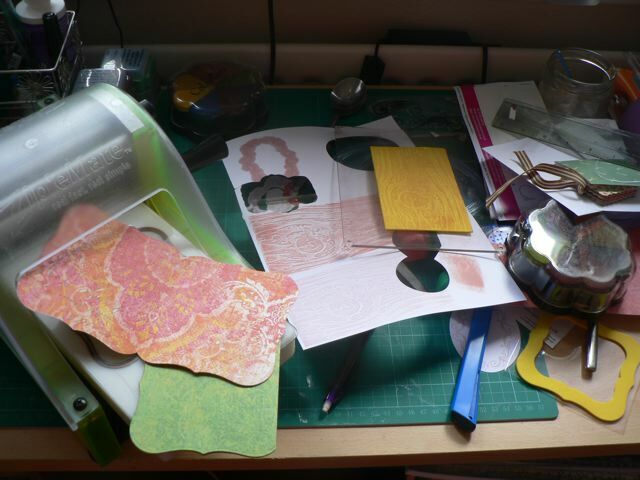 I have a bunch of various makes of embossing folders. The other day I was looking at them and thinking how I would like having some of them as stamps. So I started to look at what I had on hand and how I might do that. I had a few sheets of Fun Foam hanging about and that seemed a like it might work. So I put my experimenting hat on and had a bit of a play, with, I think, not too bad results. What I did was cut a bit of the foam a bit smaller than the folder – I thought the full size folder might be difficult to work with, and to be honest didn’t have a big enough piece of foam left! – then heated it slightly with the embossing gun. 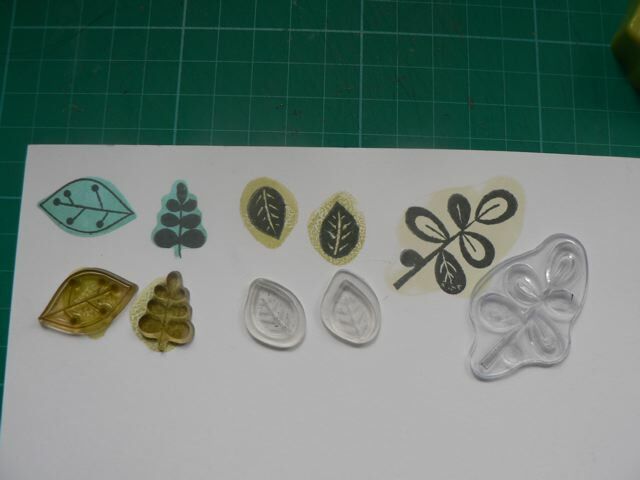 Like the previous post about embossing fun foam with stamps, you do have to be a bit careful in this step. You don’t want the foam melting or god forbid bursting into flame! While it is still warm. 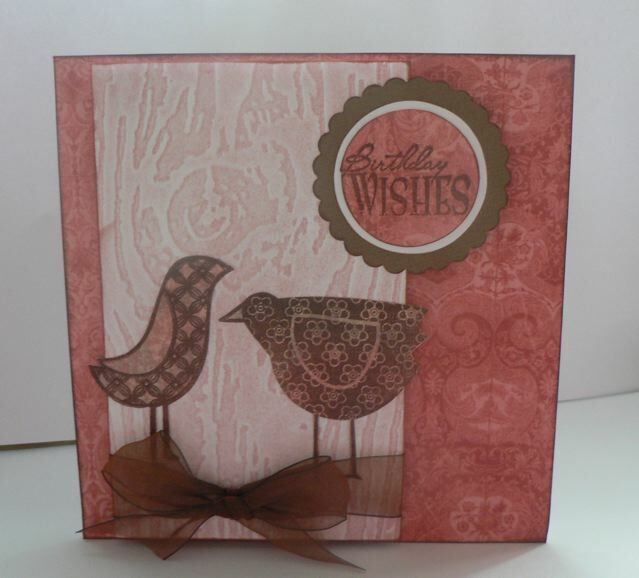 tuck it into the embossing folder and run it thru your embossing machine. 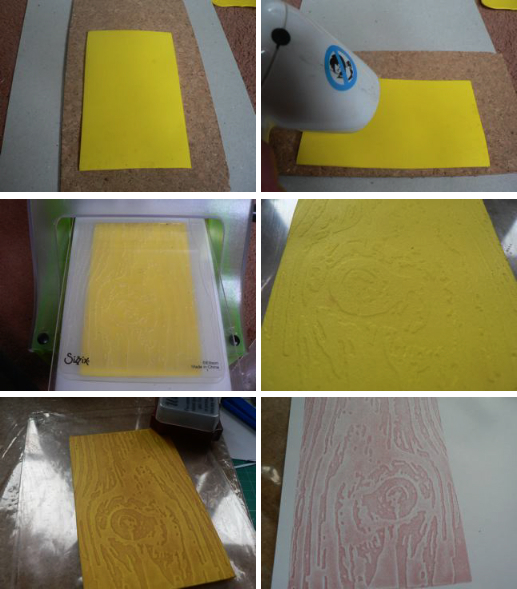 Once the foam is embossed, stick it to a block of some kind with something like repositionable dots and stamp it. I used dye-based ink and more swiped the ink across the surface than tamping it on as that seemed to give better coverage and hits the high points (which are not anywhere NEAR as high as a normal stamp is) better. Pigment ink can sort of sink into the low spots, which may be ok, depending on the look you want. It IS different than a proper stamped image, but it works for me. 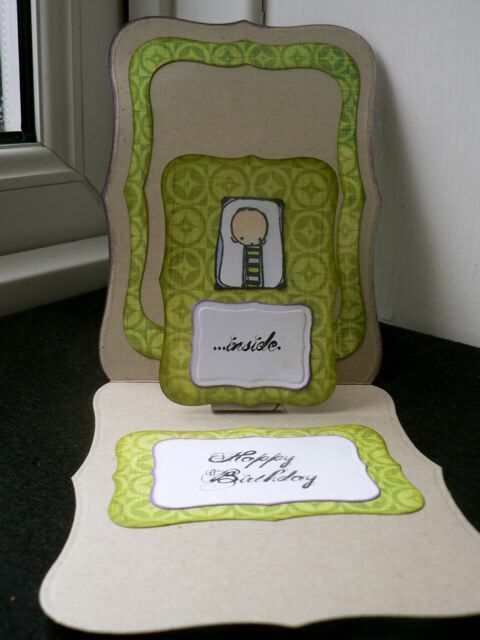 As I have three birthdays coming up on the 14th (sister, Dad and MIL) I made a card using the stamped bit. 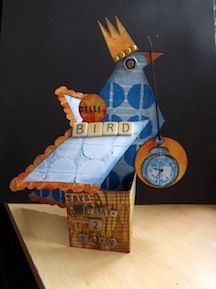 I’ve done a few bits and bobs this way (some small images from on of the TH embossing folders that was a collage-style image, cutting the individual bits into little stamps. The best part of it all is that after you clean off the stamp (with a baby wipe) you can hit it with the heat gun and it will smooth out so you can do use it again. I suspect the embossing would eventually smooth out, I’m not sure you could make one of these and store it for long term use, foam isn’t that stable a medium, but as it’s no hardship you can just remake it as needed. I do so love making supplies do double duty. 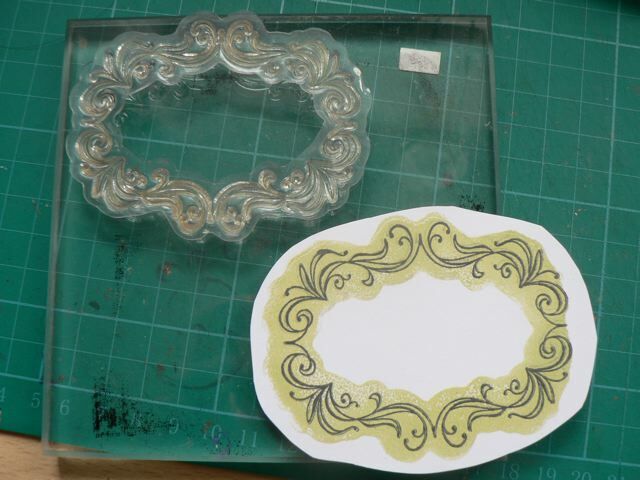 Categories: stamping, tips & finds | Tags: how-to, stamps | Permalink. Now I am back from holiday I should be back to original content on my blog, starting with this one today. If you are like me, you always look for new ways to use existing supplies. 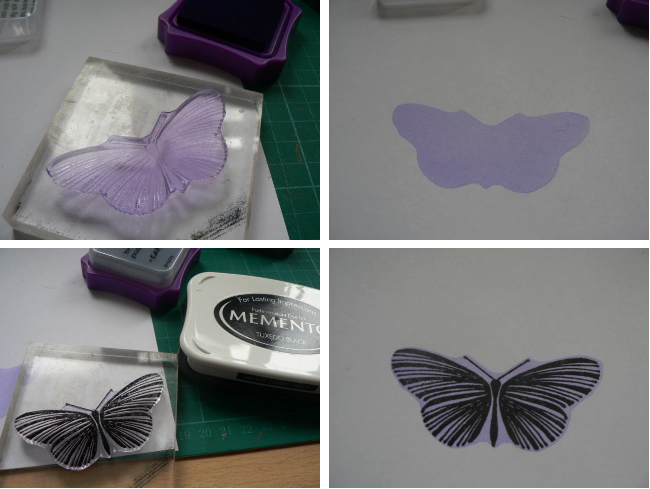 A while back I posted about using the outline shape of clear stamps to create a pattern to cut stamped images out that was neat and looked like a pre-made embellishment. I am NOT a great cutter-outer when it comes to leaving a uniform border. This trick helped me, especially with journaling stamps and frames, to end up with something that looked a lot better than what I could create cutting on my own. 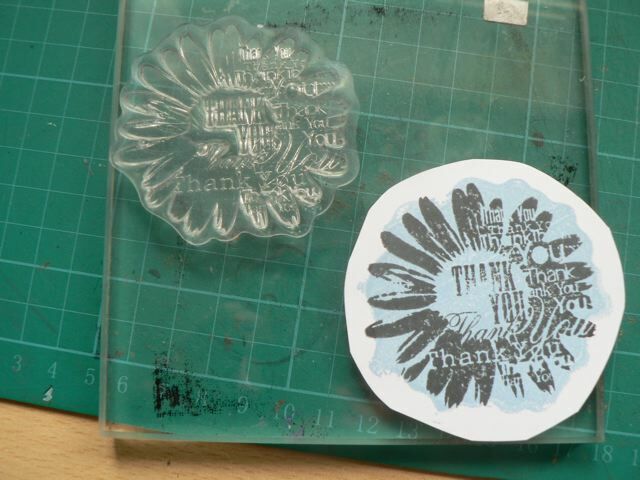 It got me thinking about clear stamps and last night, on a whim, I tried something out – it worked! Basically you press the etched side of your stamp (the part you would normally ink) to you mount and ink the BACK of the stamp and stamp that on your paper. You can use any ink dy-based, or pigment ink for this so long as you clean your stamp as soon as you get done so you don’t ruin the “sticky” effect that will let you stick it to the mount later. As with many clear stamps, mostly Distress Ink is rubbish for this, unless you really want a speckled mottled background. Flip the stamp and stick it to the mount in the normal way then ink again. So they would show up well here I used black ink, but monochromatic, tone on tone looks nifty too. Stamp this over your shadow. Now you can cut out along the shadow edges . It goes without saying that any symmetrical stamp (square, circle, oval, rectangle, some flowers) will work but anything oddly shaped won’t. The stamped image you get from the reverse side of the stamp won’t match up. The outline ones, like the first one, work best. I think it gives a sort of 1950s retro look to the stamps. You could stamp with the back on the reverse of card or patterned paper then flip it and stamp the image on the other side, which would let you use oddly shaped stamps as well. If you are a neat cutter-outer, this will seem pointless (really, I can cut quite intricate fonts easily so long as I am following the lines) if cutting leaving a uniform border is a struggle this tip just may make your life a bit easier.